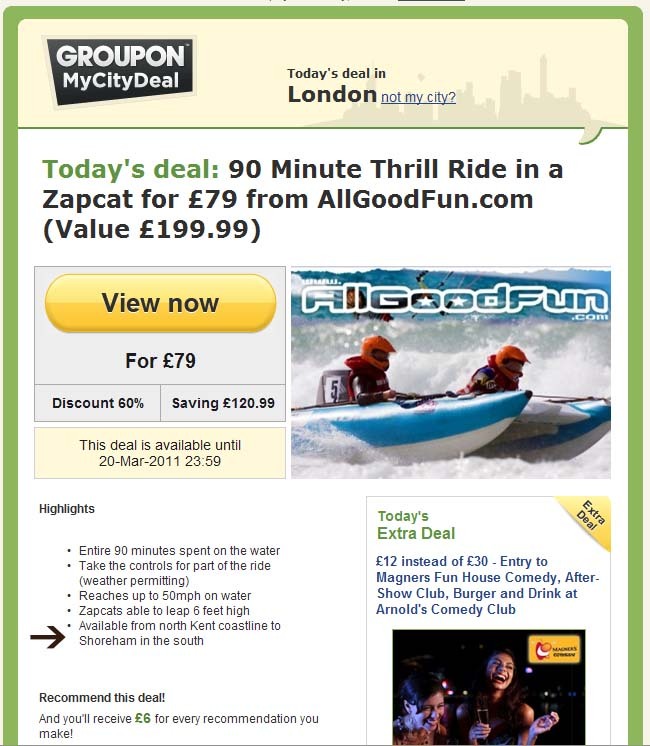 I’ve long resisted the urge to externalise my confusion around the hype surrounding Groupon. It feels like there’s this growing bandwagon that is building momentum, and like any high-profile and growing channel, it sometimes takes bravery to put your hand up and say “sorry, I don’t get this”. My understanding of Groupon was that its power came from a combination of reach and relevance. Targeting very localised offers would help promote local businesses and encourage product/service trial through a sales promotion. So I signed-up. I commute into London, but my home town isn’t on Groupon. So I chose London as the nearest City, which is a compromise in itself. Here’s an example of one of these ‘local’ offers I received on day 2. Some speed-boating fun off the Kent coast, which doesn’t feel either well targeted or relevant for my interests. I confess to having a low irritation threshold for things like this, but I’m sure I’m not alone. Now, maybe the average online order value for a brand like ASOS will be able to absorb this kind of cost per acquisition within the increased basket value of the final order (I’d love to see a case study on income and profitability outcomes from this promotion). BUT how many small, local businesses (who I thought were at the core of the original Groupon idea) can afford to spend £72.50 to attract £100 of revenue? Those that think they can may not be there to take advantage of any future business from loyal customers acquired through this channel. This entry was posted in Demand generation, Digital Marketing, Marketing and tagged 'Steve Revill', Groupon, marketing, roi, sales promotion, vouchers on March 20, 2011 by Steve Revill.